crafting with katie: MCT 35th Edition Release Blog Hop! Are you ready? It's hopping and shopping day! 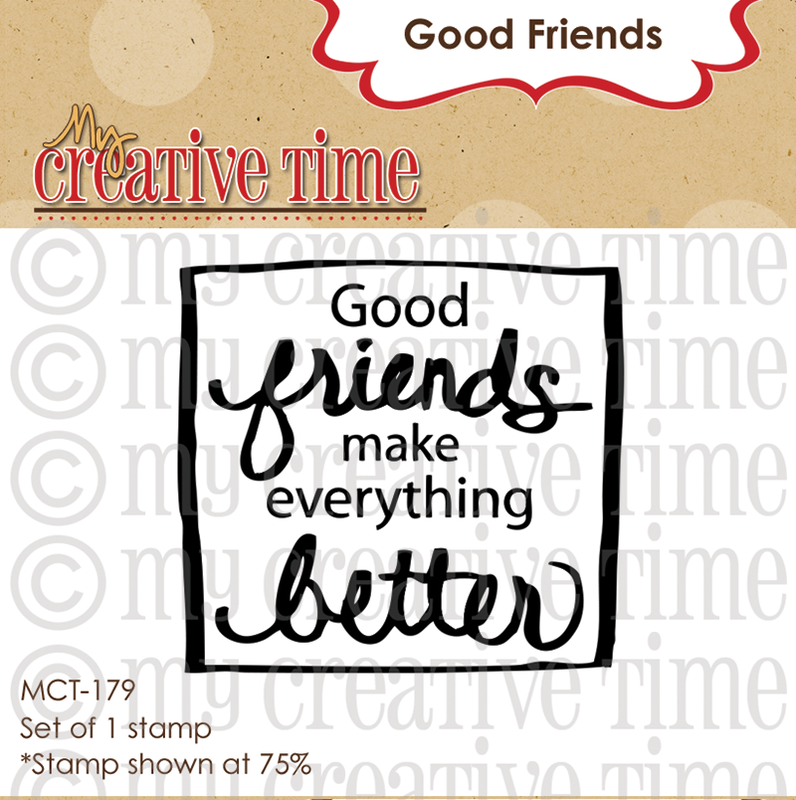 All of the wonderful My Creative Time stamps and dies that we have been sneaking this week can now be purchased! If you just happened upon my blog, you might want to head over to Emma's blog, which is the beginning of the hop. It was a little bittersweet making today's card. I'm driving my son five hours away, to CalArts, on Monday for him to start his freshman year of college. I thought this would be the perfect card to mail to him after I get home. I started with a 4 1/4" card base and added a 4" blue square made with the die from 4x4 Journal Die + More. 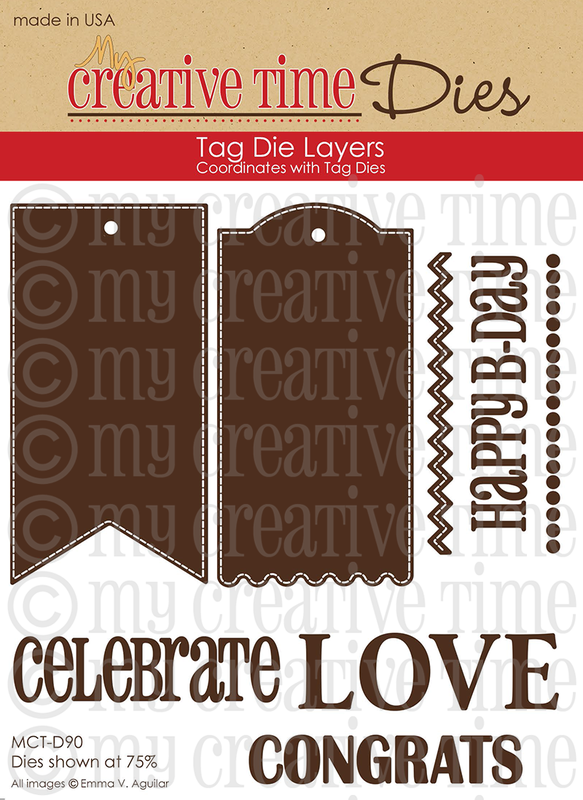 Then I added a fun chevron strip that I made with a die from the new Tag Die Layers. The dies in this new set are not only great for tags, but also make wonderful accents for other projects! How cute is this polaroid camera??? All of the little pieces were made with dies from the new Picture Perfect set! I added Glossy Accents on the two smallest black circles to make it look more realistic. Now this is my favorite part! Picture Perfect comes with this teeny-tiny polaroid die. I printed a picture of Eric and me small enough to fit in it (a little less than an inch in width). Then I popped on a heart made with a die from 4x4 Journal Die + More. Isn't it the cutest little thing? There are several different word dies in Picture Perfect and the tiny size of them is just adorable! Here's a closer look at the three sets I used on today's card. 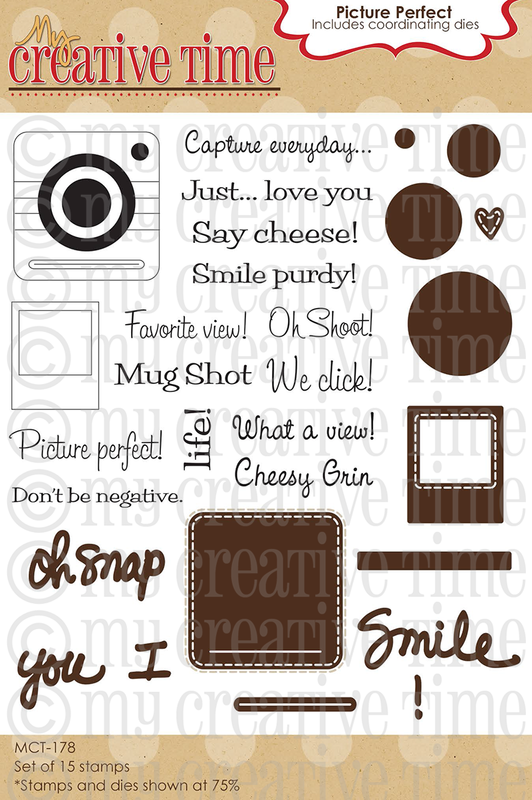 All of them are available for purchase now in the My Creative Time Store! Since the last release was such a success, Emma wanted to show her appreciation by giving away this FUN new stamp to the FIRST 150 shoppers! Yep, you head that right, this stamp will go to the FIRST 150 shoppers for FREE! You do NOT have to add it to your cart; Emma and her shipping crew will automatically include it in your package, but ONLY to the first 150 shoppers! IF you happen to come through AFTER the 150th shopper, no worries because this will be available for sale! Emma knows there will be questions on whether YOU made the first 150. After the first 150 shoppers come through, then you will see this set available for purchase along with the new release items! Also, DON'T FORGET our sale that is starting RIGHT NOW! Use the code AUGUST2014 to receive 20% off your entire purchase! Sale ends on September 5th @ 11:59 PM, PST. Oh my goodness lady, I can see how this was bittersweet to create this card :( We will definitely have to plan a "retail therapy" day for sure my sweet friend. Your card is ABSOLUTELY PERFECT Miss Katie! HUGS & LOTS OF LOVE for a safe journey taking your baby off to college! Great card. Love the picture of you and your son. This little camera is so cute! Love you card! lovely card! I love the colors you used! nice pic too! thanks! What a sweet and precious picture and card....girl I know it's bitter/sweet. You so rocked this release and love what you created!! I just love this I brought them all. 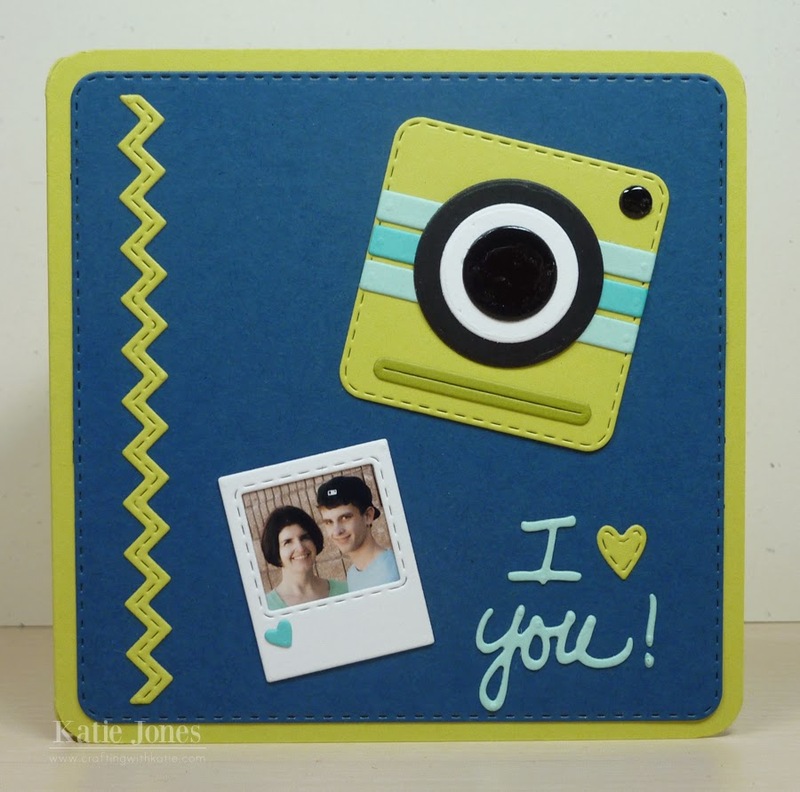 Love the colors you used and love that Polaroid die! I so feel ya ... We took our son last week to start his first year of college. I have a feeling I'll be "borrowing" this inspiration ��. Thank goodness for Skype :D Eric will get a huge smile when he gets this sweet card! 5 hours is not a be right there distance...sad but exciting all at the same time. 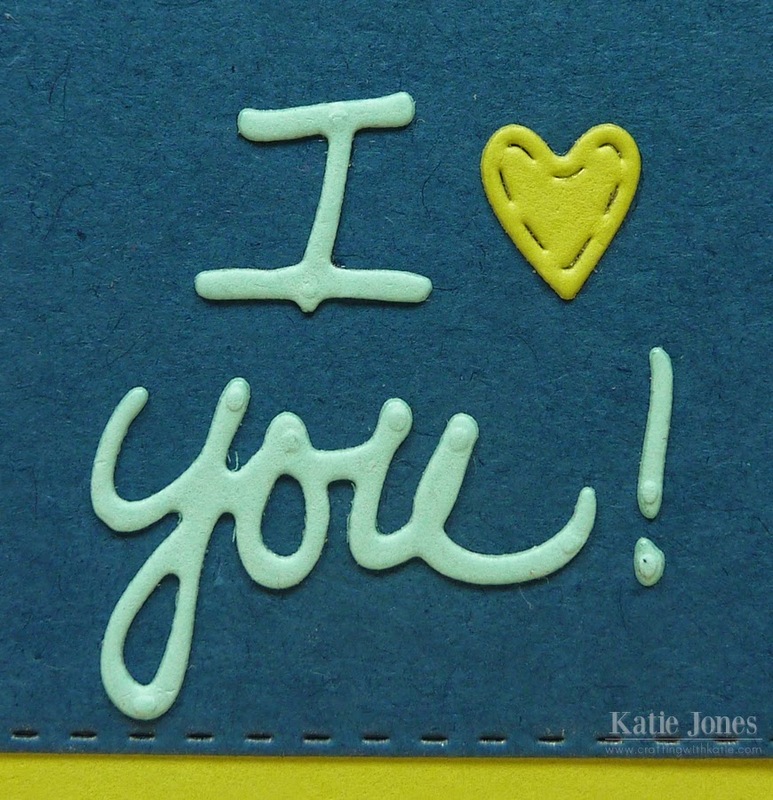 I love the colors of your card and the sentiments in this set are great! Wonderful job on your card...have a safe trip! Awesome remembrance for your son. He's going to be happy to get mail and he's going to love the pic of both of you. Having them leave is tough, but sadly is a part of life that can't be avoided. We've been empty nesters for 10 years now. It's been a joyous time, but in a different way. What a fabulous layout Katie!! I love the colors that you used and the design is so awesome!! Hugs!! Your son will enjoy getting this card - a little bit of home and mom that he can display in his room. Love the embellishments on the camera. thanks for sharing. Have a safe trip Monday. What a beautiful card Katie! Your son will love it! Very SWEET card, great pic of the two of you, love your colors and elements. Awesome awesome, I love your beautiful creations, tfs. Awesome card and great picture of the both of you! Good luck to your son as he starts his first yr of college! I have seen several Polaroid type cameras and this is the best one I have seen. Love it!! Love this new release!~ Beautiful picture! Great card Katie. Your son will love it. I'm sure it's not easy letting him go. First my heart goes out to you Katie, taking your son to college is a lot like the very first day you took him to kindergarten! He is going to love your card! It's awesome and tells him how much you luv him. Thank for sharing this with us! Don't worry they will always need their Moms! Your card is so great, the color combo is fresh and fun and I am sure it will bring a smile to your son's face! Fun camera card. Your son will love it. My kids moved to So Cal about 5 hours away. I miss them, but on the positive side it is fun to make special cards and to send care packages. Great card. 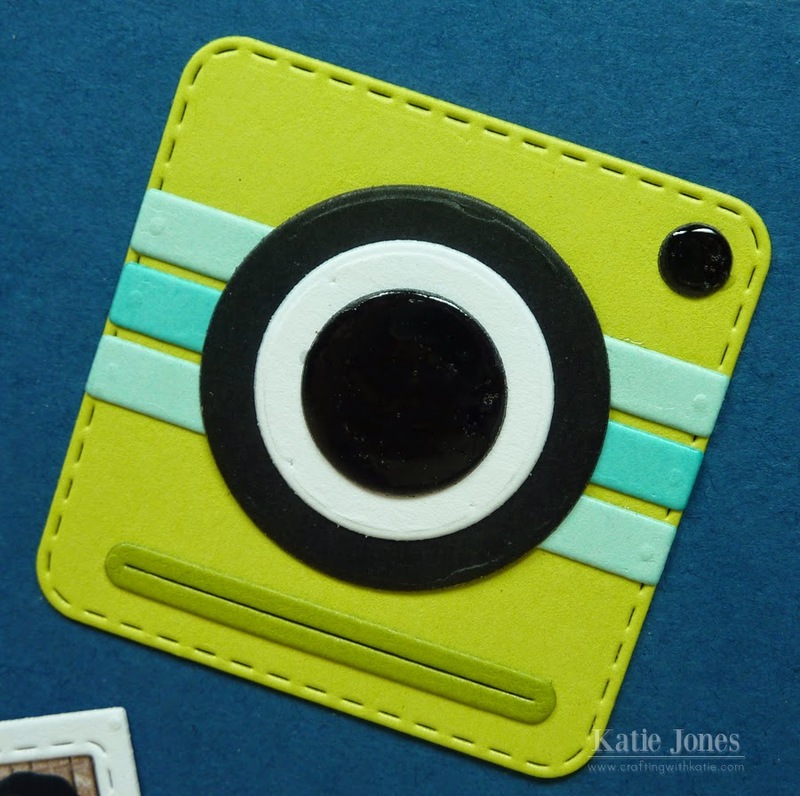 Like the idea of the pic and am loving the new camera die cuts. 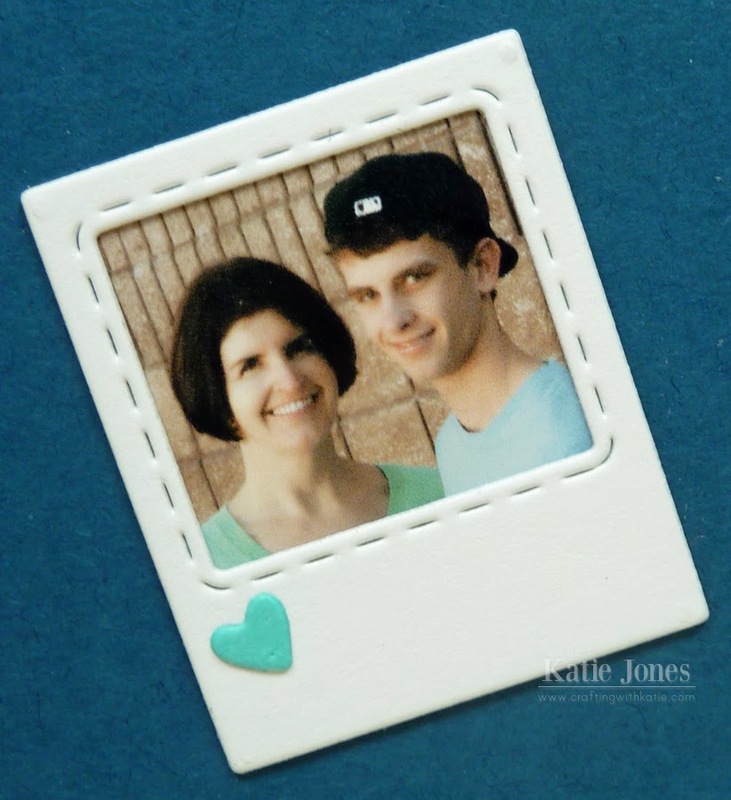 Katie, Congrats to your son and congrats on this project and all the projects you have done! What an inspiration!!! Such a sweet card! It's so wonderful how close you and your son are. What an awesome card Katie! I know your son is going to love getting it in the mail at school!!! Ohhhhh Katie!!! What a bittersweet moment indeed. But this card is just wonderful! Love that pic of you two. Have fun and take in every moment. Hugs to you and lots of luck to Eric!!! Katie, I know that this card was made with lots of tears and gut wrenching emotions knowing that Eric will be five hours away which is a world apart for you. Always hard letting them go but knowing that he is following his dream helps a little. Take care of yourself and have a safe trip driving him to school. Sending you lots of hugs. OMGosh taking our babes off to college is both exciting and oh so hard. Please care of yourself. I LOVE your SWEET card and so will he. Thanks for sharing your talents and your time. Super cute! Love it! Thanks for sharing! love the card!! great dies can't wait to be able to shop!! Cute card - love the bright colors. What a fabulous card!! He will love it!! Great idea to remember when my babies go off to college one day! Hey Miss Katie! This card is so cute and I just love that you include a picture of you and your son on this card. He will truly cherish.